During the first year of the Africa RISING project, a multidisciplinary team of researchers held discussions with some 4000 people in Northern Ghana. The study provided an overview of existing farming practices and the constraints associated with crop and livestock production. The community analysis, as it is known, also identified activities that could increase farm productivity, reduce poverty and restore the region’s degraded soils. Among those who took part in the discussions was Oscar Dong, a young farmer in Guo, a village in Upper West Region. Like many others involved in the community analysis, he was surprised – and pleased – to be consulted, and he and his farming friends were able to tell the research team about the problems they faced. Oscar Dong is the leader of the local farmers group. Mother trials have been established on his land and he has helped to manage the crops. He also has his own baby trials, which you can see in these photographs. (Photo credit: Charlie Pye-Smith). Not long ago, Oscar used to get seven bags of maize per acre, equivalent to 1.7 tonnes per hectare; now, he gets half that amount. His soils have become progressively more infertile, and mineral fertilisers are so expensive that he can only afford to buy small quantities. 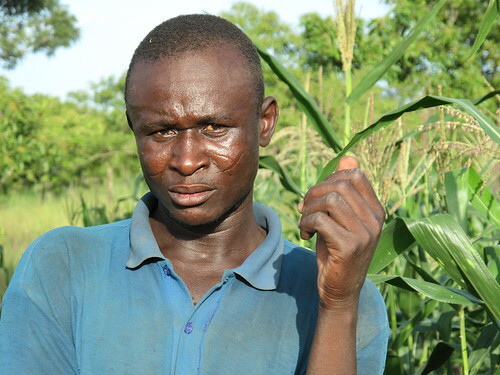 He has four acres of land, but doesn’t have enough money to pay for the tractor service to plough the whole area. That means he has to leave some fallow. “When the Africa RISING team explained that they wanted to establish trials in Guo to test a range of improved crop varieties and management practices, I was eager to get involved,” recalls Oscar. Being a well-respected member of the community, he was chosen as leader of the local farmers’ group, which played an important role in managing the ‘mother trials’ and setting up ‘baby trials’. The mother trials at Guo were established – Oscar remembers the exact date – on 13 July 2013. Working under the guidance of IITA technicians, the farmers prepared the soil, planted the seeds, and fertilised and weeded when appropriate. The trials consisted of six improved varieties of maize, six of cowpea and six of soybean. Half of each crop were given the recommended dose of fertiliser; the other half a higher dose. The farmers also planted control plots of traditional varieties, and each of the 16 members of the farmers’ group established their own baby trials. In contrast, the early-maturing, drought-resistant varieties of maize in Oscar’s baby plot are now head-high, with fat cobs almost ready to harvest. “It’s looking beautiful,” he says proudly. “Although I planted the maize in my baby plot later than my traditional variety, it is doing much better, and I’ll be able to harvest it soon and get cash in the market.” He estimates that he’ll get the equivalent of 10 bags per acre from the improved varieties of maize, which translates into 2.5 tonnes per hectare. Talk to any of the farmers who have been closely involved with the mother and baby trials, and most will begin by telling you which varieties they like. “I planted two varieties of improved maize on July 1 – just before the drought set in,” says Abdullah Iddrisu, a farmer in Tibognaayali, “and although they suffered from the lack of rain, they survived, because they are drought-resistant, and I’m going to get a good harvest.” In contrast, the traditional variety which he planted a month earlier withered and died during the drought. However, he is keen to stress that he is getting much more from Africa RISING than new crop varieties. He has learned a whole new set of skills and now he has a much better knowledge about how to manage his crops and his soils. You will hear much the same story in Upper East Region. With its drier climate, farmers favour sorghum and millet as their staple crops, although increasing numbers are now growing maize. 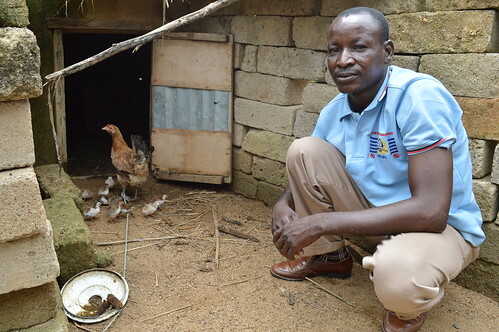 David Adugdaa Atia may be better educated than most people in Samboligo – he teaches adult literacy classes and speaks English – but in many ways he is a typical farmer. He grows millet, sorghum, bambaranut, cowpeas and a small quantity of maize. He also has three sheep, eight guinea fowl and a dozen or so hens. Like many farmers here, David Atia is looking forward to Africa RISING’s research and development activities for livestock. He has a few chickens, guinea fowls and sheep. None are very productive (Photo credit: Charlie Pye-Smith ). When the Ministry of Food and Agriculture (MOFA) organised a field day in Samboligo in early October 2013, over 100 farmers turned up. Although this was a busy time of year, with the harvest of early-maturing crops already underway, the farmers were happy to spend half a day examining the mother trials and learning about the improved crop varieties introduced by Africa RISING. Tags: Charlie Pye-Smith. Bookmark the permalink.